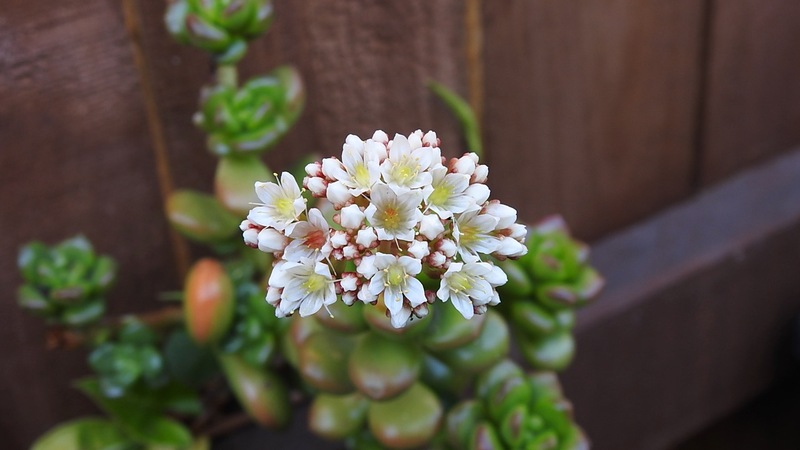 Meet one of the easiest plants to grow, in fact, it’s also one of the easiest plants to propagate – Sedum rubrotinctum. Commonly referred to as the Jelly Bean Plant or simply Jelly Beans, it’s also known as Pork and Beans and Brown Beans and even Christmas Cheer. The specific variety in the following photo is ‘Aurora’, the Pink Jelly Bean. Those charming pink and cream flushed leaves are all that’s needed for me to highlight this plant for Becky’s ‘In the Pink’ Square in September photo challenge. Sedum is a large genus of flowering plants that belong to the Crassulaceae family which are commonly known as the Stonecrop family or the Orpine family. With more than 600 different species, I couldn’t possibly go into all of them, however, these plants are characterised by their water-storing leaves and flowers that are usually star-shaped with five petals. ‘Stonecrop’ comes from gardeners joking that only stones need less care and live longer. These plants are ideal for the neglectful or lazy gardener; they thrive in poor conditions and are perfect for that patch of garden where nothing else will grow. Too much sun or not enough water, they don’t mind because they need very little attention and will flourish regardless. I have lots of different varieties of Sedum in my garden, not because I’m a neglectful gardener. I’d like to think I’m far from that. I have them because of their ornamental properties. 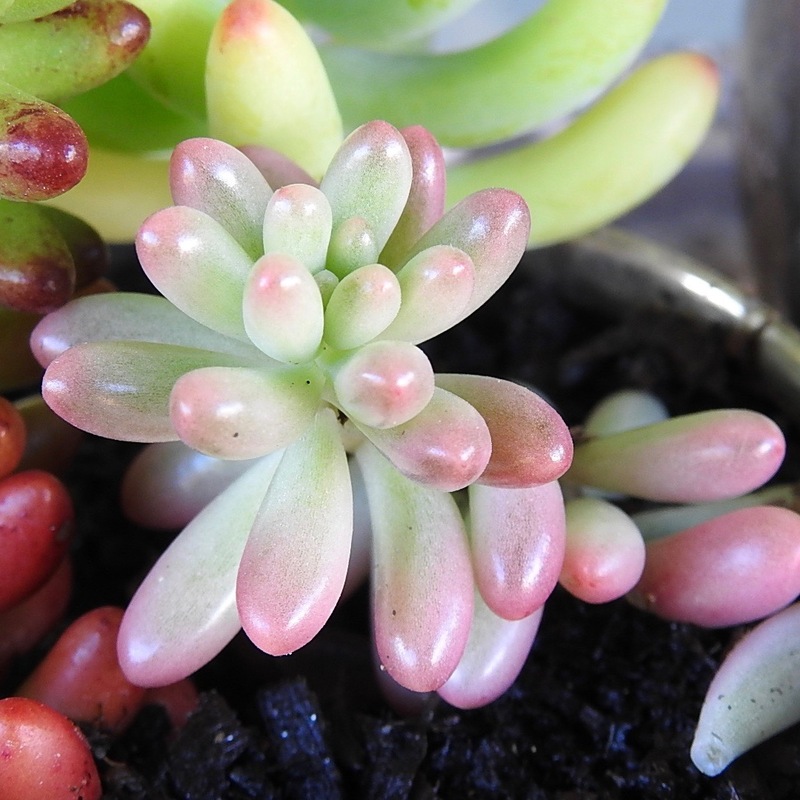 In particular, Sedum rubrotinctum is prized for its jelly bean shaped leaves and the attractive swirling pattern they make. It can grow up to 15 cm tall (6 inches) and spread up to 90 cm wide (36 inches) and producing yellowish-white flowers during summer. I’ve never seen flowers on my Pink Jelly Bean, but that doesn’t mean they won’t bloom this season. A new plant sprouting from a dropped leaf. As for propagating Sedum, these plants root very easily. All it takes is one of those fat little leaves placed where you want it to grow and before you know it, it will have sprouted roots and begun to grow a new plant. Within a season (or sometimes a little longer) a whole new plant will have established. 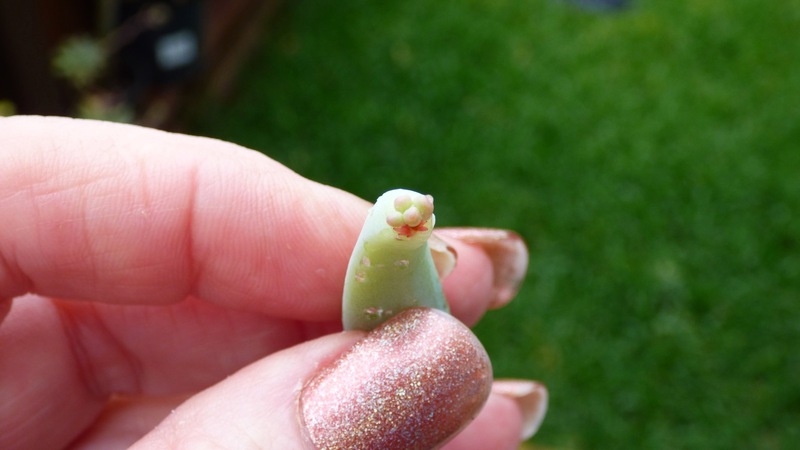 It feels strange to comprehend that propagation can be accomplished by simply laying a plant on the ground where you want it to grow. Unbeknownst to me, I’ve dropped the odd jelly bean or two and, surprise, surprise, suddenly plants have sprung up where they’ve fallen. It really is that easy to grow them, and here where I live, they seem to flourish in the subtropical climate. Oh, by the way, if you want them to root and grow quicker, all it takes is a handful of dirt placed on top of them, and away they’ll go, sprouting and growing like crazy and producing lovely little plants in no time at all. The Pink Jelly Bean isn’t the only variety in my garden. As no doubt you’ve already guessed from my main photo, I also have a least one other that’s flushed bright red, and yet I have many more than that. I also have a Donkey’s Tail that is often referred to as a Jelly Bean but not by me. Yes, it is very similar, closely related, but – and I do have to say this – once a Donkey’s Tail, always a Donkey’s Tail. Almost all of my ‘other’ Sedum plants are in flower, but the Jelly Beans have been a little slow to bloom. And finally, these stunning flowers are on a rather plump variety but notice the rose-shaped growth in the background. That is another reason these plants are grown for their ornamental displays. Since I spent a bit of time reading about how to better care for these plants today, I also spent time with them doing a little repotting as their growing season arrives with the warmer weather. I can’t believe I said that because at 6:00 am this morning it was only 8°C (46.4°F) and cold enough for me. All the same, the weather will warm up soon enough and I’m looking forward to some substantial growth from all of my Jelly Beans. Next Post How Could I not be Tickled Pink? That is such a perfect name for them. Brilliant. Quite fancy a few pink jelly beans now . . some of the flavours of the pink ones though are a bit odd! They do look almost good enough to eat, don’t they? As for edible pink jelly beans, pink lemonade flavour is ok, but I’m not fussed about the sour cherry. That’s the one I don’t like!!! Interesting. They are fabulous! Going to see if I can get those in AZ! Or here in Pennsylvania! Happy hunting Nancy. I’m sure you’ll find some.